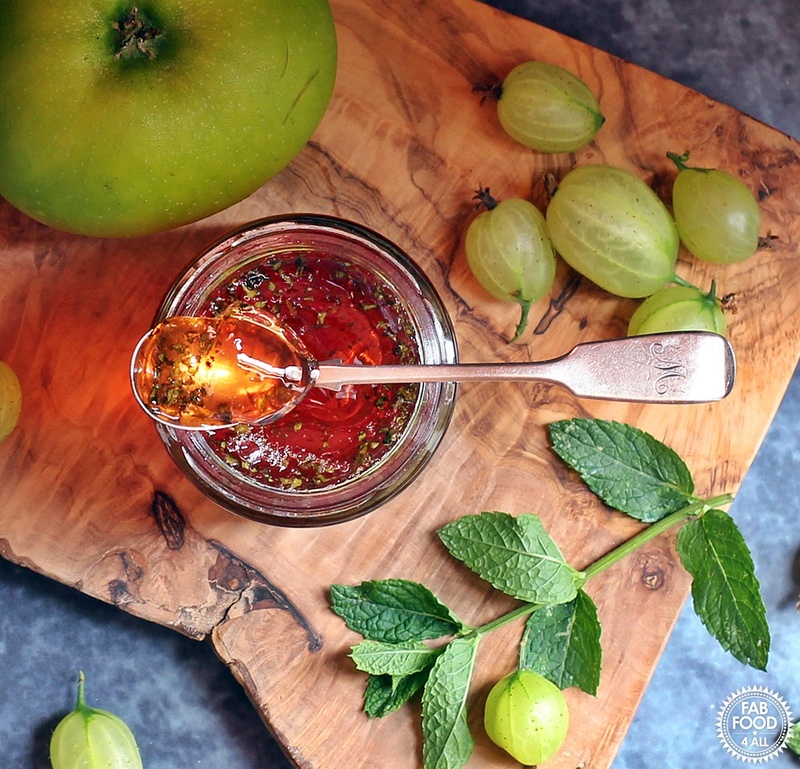 I’m thrilled to be sharing this absolutely awesome Gooseberry, Apple & Mint Jelly with you! After discovering that jelly making is pretty easy and doesn’t require a special jelly bag or an upturned stool when I made my Blackberry & Apple Jelly I decided to make another jelly. 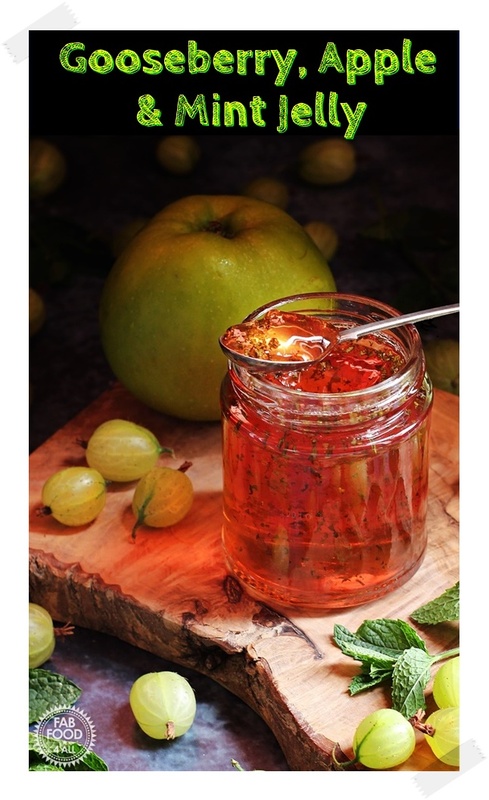 On finding 3 punnets of reduced gooseberries and having some Bramley apples in the fridge I decided a Gooseberry, Apple & Mint Jelly would be a fab combination. 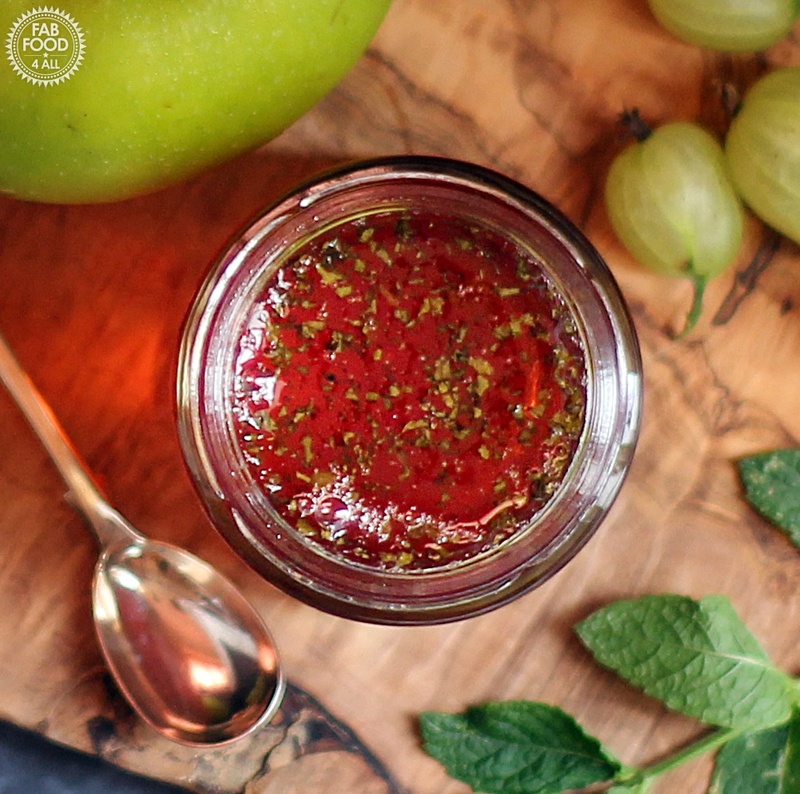 I already have a Gooseberry & Apple Jam on the blog so knew these flavours married well. 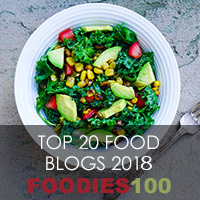 What is the key to a good flavour? 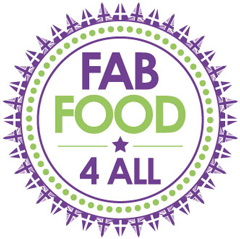 The key to a really good flavour is to use a good quality cider vinegar, I used a Taste Award winning organic one. Your gooseberries should be verging on under ripe, to just ripe you don’t want soft ones and there’s no need to top and tail. I did top and tail mine as I was toying with cake making to begin with! The sharp tasting Bramley apples also get chopped whole so unlike jam making, prepping the fruit for jelly making is a lot quicker. Using fresh and not dried mint makes all the difference too. 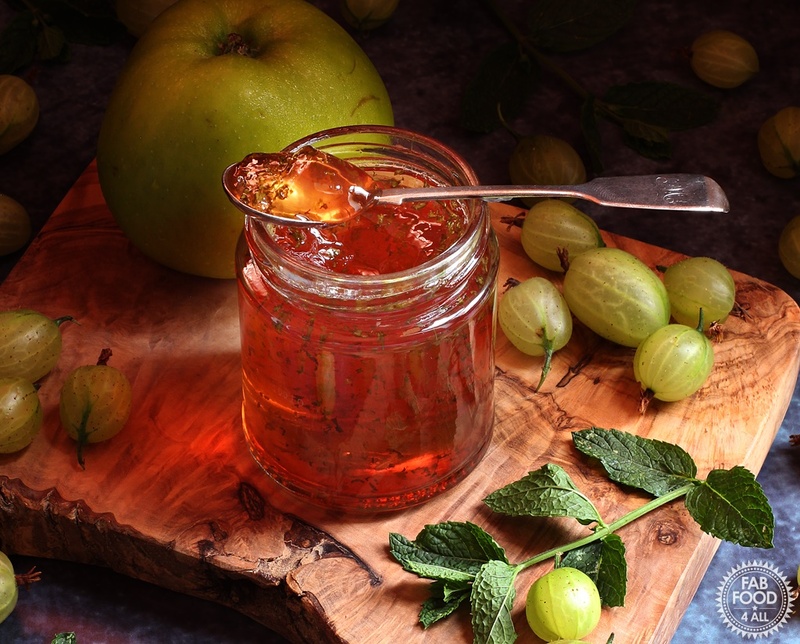 What makes this Gooseberry, Apple & Mint Jelly special? The beauty of this jelly is its jewel like clarity the suspended chopped mint (if you were entering a show these things score you extra points). These are achieved by not squeezing the fruit while it’s dripping (do not be tempted) and using freshly chopped wet mint leaves (so that they are damp when adding). This stops the chopped from floating to the top of your jelly and waiting for the jelly to cool a little also helps the mint to disperse evenly. 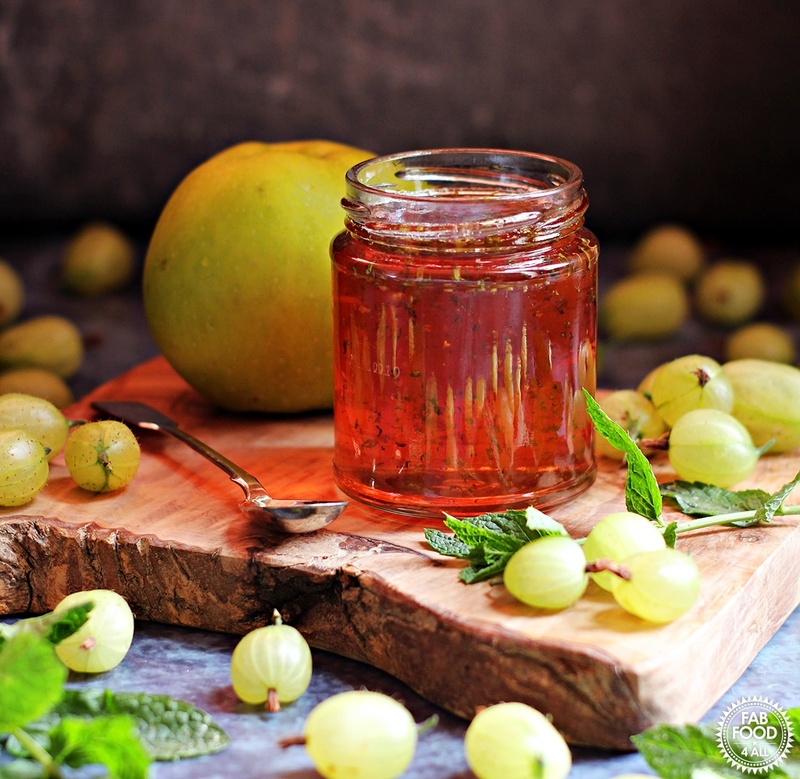 What does Gooseberry, Apple & Mint Jelly go with? Well the number one use is with lamb, whether that’s barbecued (use as a glaze), pan fried or roast. I also tried it with some Cheddar cheese on a cracker this afternoon and liked the fresh kick it added. I am a total fan of this jelly so I think I’ll be adding it to anything I can basically! 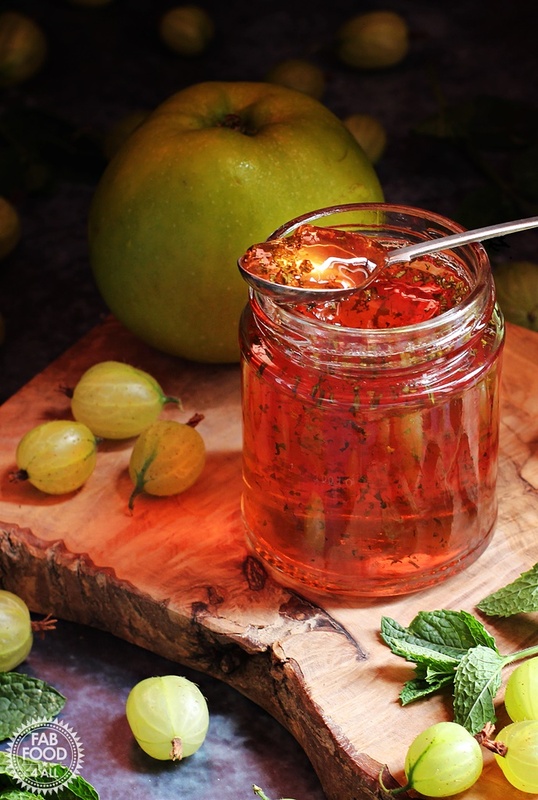 Gooseberry, Apple & Mint Jelly has such a beautiful, delicate and refreshing flavour with a back note of cider from the cider vinegar. The perfect accompaniment with lamb. Chop the whole Bramley apples into dice (don’t peel or core) and tip into a preserving pan or large heavy bottomed pan along with the whole gooseberries (don’t top & tail). Add enough water to just cover the fruit and then add the bunch of mint. Bring to the boil and then reduce to a simmer and cook for 30 minutes (or until fruit is soft). Add the cider vinegar and simmer for another 5 minutes. Take off the heat and pour into a jelly bag or similar (see notes for my hack) and leave to drip overnight over a large container. (Do not squeeze the fruit or jelly will be cloudy not clear). Place 2 – 3 saucers in the freezer for testing set. Measure the juice, add to preserving pan and stir in 450g or granulated sugar for each 575 ml of juice. Heat gently to dissolve the sugar, stirring constantly. Remove any scum with a slotted metal spoon. Once the sugar has dissolved slowly bring the pan to the boil and once at a rolling boil, time for 15 minutes, keep stirring, then take off the heat. Test a few drops of jelly on a chilled saucer and pop in the fridge for a minute. Push you finger through the jelly and if it crinkles and forms a gel like clot which you can tip over then it’s ready. If not boil up for another 2 minutes at a time and repeat test until ready. (Mine took 17 minutes). If there is any scum left then remove (there shouldn’t be now). Allow the jelly to cool for a few minutes while you rinse and finely chop the mint (see notes). Then stir the mint through the jelly to evenly disperse. Pot up into10 small (190 ml) hot sterilised jars (see notes) using a ladle and jam funnel if you have one and place lids on immediately. You may find the jelly tries to set before you get it in the jars, if this happens then just set the pan over a low heat. Store in a cool, dark place (eg garage) and once opened keep in the fridge. Unopened jars will be good for at least a year. Sterilise jars by washing in hot soapy water (or take straight from dishwasher), fill with boiling water, empty and then place in oven for 20 minutes at 140°C where you leave them until the jam is ready. Washed lids should be sterilised with boiling water and then left to drain. To make a strainer if you don’t have a jelly bag etc, put a colander into a new pair of tights, tie the legs into a knot on the side and snip off the excess. You could also line a colander with clean net curtains, a tea towel or muslin. If your mint is bone dry it’s more inclined to float to the top so rinse your leaves, give a little shake to remove excess water and finely chop so that mint is damp when adding to the jelly. 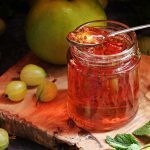 Previous Post: « Easy Blackberry & Apple Jelly with step-by-step video tutorial! Thank you so much Choclette. I thought about creating a group but just don’t have time to run one as takes a lot of work!